I guess I'm just old fashioned, but I just can't find a virtual replacement for my Moleskine. A quick Google search will reveal that I'm not the only one who can't seem to make the switch to digital. I've been working on my planner for 2013 and thought I'd share since I like getting peeks into OPP. That's "Other People's Planners". I've been keeping some form of diary/journal/planner for years. I dug out the old ones that I could find this morning to see what kinds of things I used to record. Not much has changed about the things I record in my planner, but I did figure out why I'm so tired all the time. I was working 70 hour work weeks in 1997! In the past couple of years, I've been having more fun with my planners. I figure if I'm going to be looking at something multiple times a day, it should be fun to look at. This year, I used a Moleskine XL Monthly Planner with a soft cover and I'm in love! Not only does it contain my calendar, but I've used it to journal, take notes, record ideas, sketch, make lists (gift lists, shopping lists, to-do lists, books I want to read lists, wish lists, etc. 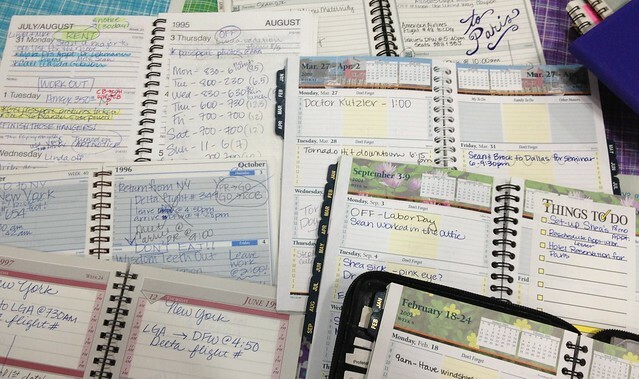 ), copy scriptures and quotes, remember passwords, write down recipes, and log my freelance work hours to name a few. It's also a good place to doodle. For 2013, I'm going with a completely blank XL Moleskine with a soft cover. With the blank pages, I can customize it to be exactly what I want. I spent some time yesterday thinking about how I wanted to organize it and drawing in the monthly calendars. I've never used a system (like GTD or the Action method), but I made myself some "action stickers" and printed out a GTD work-flow to see if I like using them. I love that paper/washi tapes are getting so easy to find, because it's a fun way to add some color and pattern to your planner. I also bought some really neat paper tapes at Daiso in San Francisco like Post-It notes on a tape roll. (I wish I'd bought more!) My favorite pens for my Moleskines are Pigma Microns. I've got an iPhone and an iPad, but I still can't give up my paper planner, I've tried. I've got organization/productivity apps like Evernote, Notability, OneNote, Toodledo, UPad, Time Optimizer, the Moleskine app, Errands, and Mindjet in addition to the calendar and reminders on the iPad, and I don't like any of them. So far, the only things I can't get my paper planner to do is make a noise to remind me to do something and back itself up. Other than that, the battery never dies, it boots up instantly, and requires no wi-fi connection. I think I remember things better when I've gone through the act of physically writing them down. So, who else can't seem to break their paper habit? 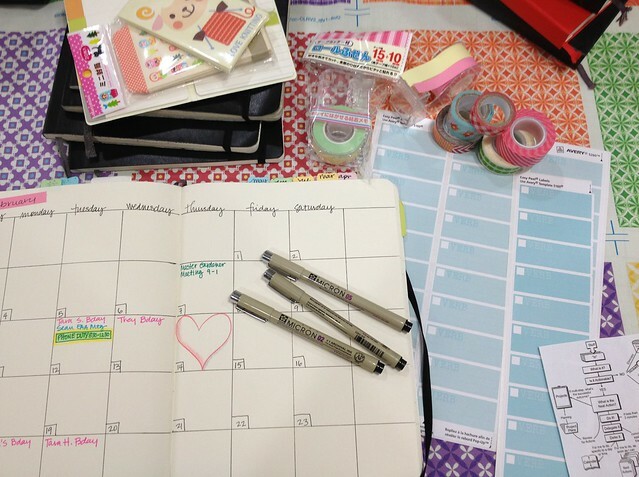 Oh, I'd absolutely LOVE to have a planner like yours. I've always been one who loves the concept of having a diary or record of a day/month/year; but have failed miserably at keeping up with it. Part of it might be because I don't think I have enough going on in my life to warrant a cool planner; but then I always have tons of random post-it notes in my purse filled with lists and such. 2013 might be the year that I give it one more try and try to stick to it. Nothing wrong with going old-school, technology can never match the good old feel of pencil to paper. I used to do the same thing. However, in my last move I decided enough was enough and reread all of my calendars and then threw them away. The only ones I'm keeping so far are last year and this year for memories with my bf. I'm guessing at some point I will scan them in and have them on film as opposed to taking up space. 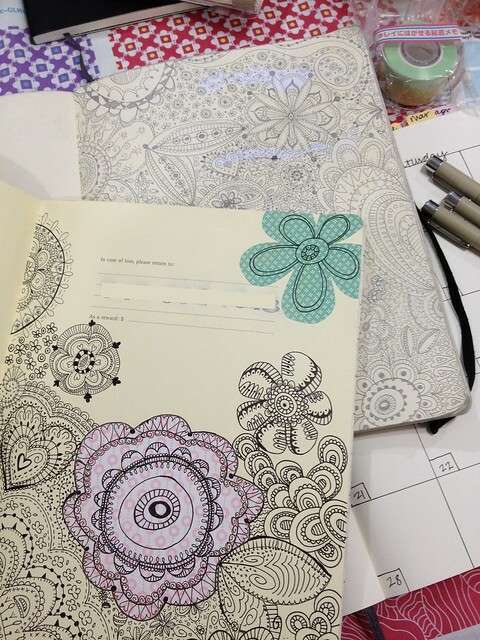 I can't give up my paper planner either! Stuffed full of notes, shopping lists, vacation plans... It is just so much easier to have it all in front of me than stored away on my phone/iPad. Last year I used Erin Condren's Life Planner, which I loved, but was able to get at 1/2-off - no luck on a coupon this year so I'm on the hunt for a new planner. For me it's not just an actual planner but real paper stuff in general. Things like catalogs, magazines and books. I've tried but just can not make the switch. Yes I shop online but nothing beats flipping through a catalog and dog earring all the good pages. I used to have a paper organizer, a DayTimer, and a leather journal. Both of which I diligently kept for years and years. In fact, my friends used to laugh at me because I'd even bring them both to special events, thus I always had a large purse. However, I did make the switch to a paperless journal and organizer this year. It was after I bought the iPad and found the NotePlus app. I write in it with a stylus so it feels almost like a pen and paper. 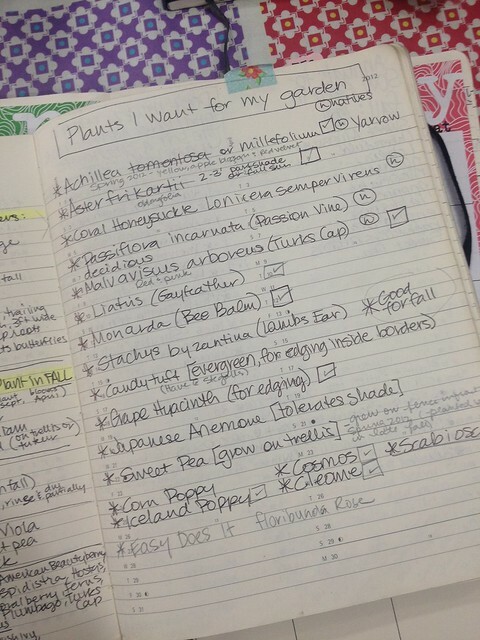 I can collect things from the web or take pictures of other things and put them into a notebook. The best part is that I can convert my handwritten text to Word doc or a blog post and it is all searchable. I never ever thought I'd make the change. But I did. 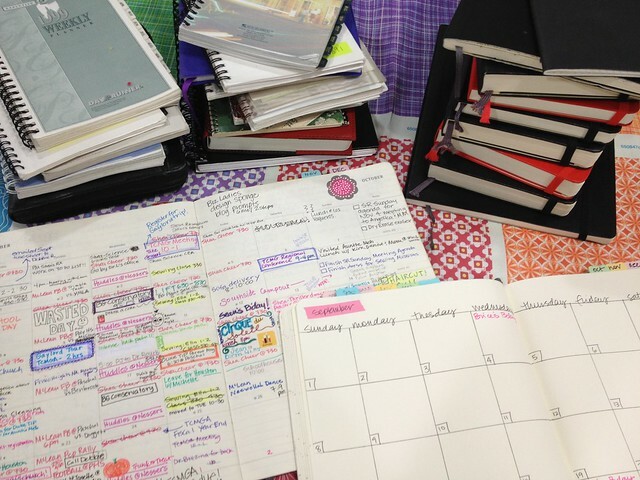 Even with the iPhone and iPad, I still tote around a planner. I make them myself and do, much like you do, notes, lists, doodles, book titles, etc. It is so much more than a calendar; I just can't break the habit. I'm glad to know I'm not the only one! Hi Melanie, I read your post with much interest! I have been using small hard cover one page per day Moleskines for the past few years and have been very happy with them, but I was definitely ready for something different this year. So I took a chance and ordered the Moleskine XL Monthly Planner with a soft cover and I LOVE it. I love having the ruled pages in between the diary bit, because usually I only have one or two things to diarise, but heaps of little notes to write to myself all the time. BTW, your doodles are AMAZING!! 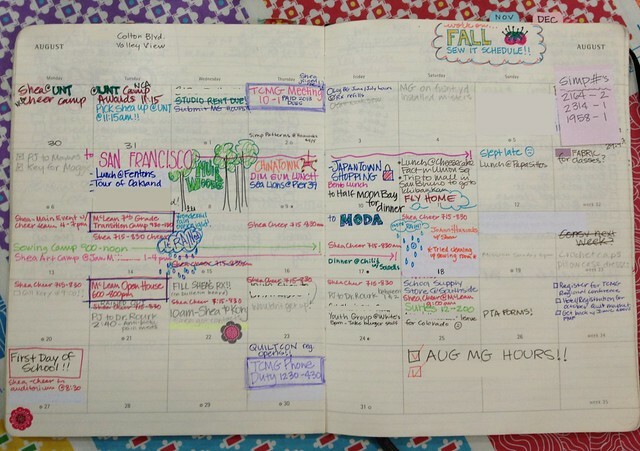 I moved away from a paper planner in 2009 and 2010, and it was a HUGE mistake. I have a great planner (combined with a moleskine) for 2013 and am much happier. Me. I can't get into the digital planner. I remember getting a Palm Pilot in 1998 from my boss... I was very impressed with this little digital thing but I could never get into using it. I returned it to him in a few months. I stick with my paper journal although I find it difficult to find one that fits all my needs... After reading this I might look into that XL Moleskin. Sounds like a great diary. I always missed pages where I could list things and take notes. I like this post. Long live the written word!!! I will never adjust 100% to digital world. I keep a paper calendar and then have a small spiral to take notes in BUT I am never happy with my need to have everything neat. After seeing this post, I love how you go back and see and reflect on the past through your writing, doodles and such. I'm now going to get a XL thingy book and try this out. Thanks so much. I love carrying mine in my purse for notes here and there but my calendar is always at home on my command center so this is perfect for an all in one! Thanks so much for putting this all out there! I'm set for 2014!